This book is INTERRUPTING CHICKEN. It’s about interrupting. I know what interrupting is. It’s when somebody says something and you want to say something so you just start talking. 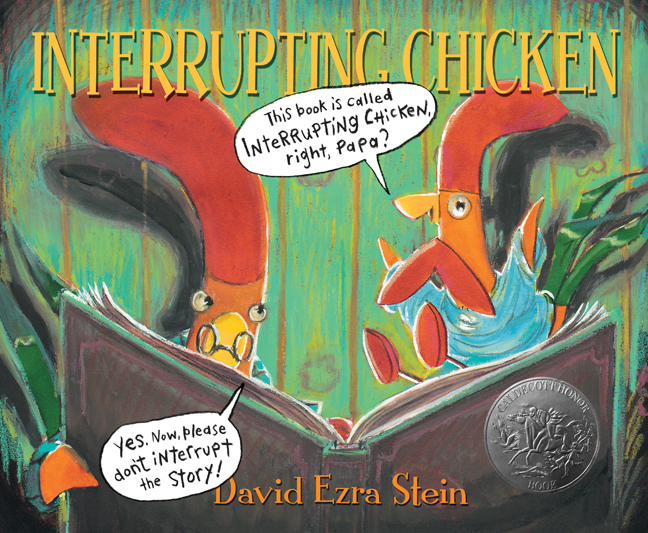 [In the story] there’s Papa and he says, “Not today going to interrupt” and he [little chicken] says, “No,” and he interrupts anyway. I think the book is funny just because he interrupts. You get to do whatever you do. I want to keep it. Can I? Please Mama, please? And in case you need further encouragement to pick this up, here’s the book trailer. Oh i love this critique!?!? Fabulous job [little kid]!